As cool as beer is - and let's face it, there are few things cooler than sipping a cold PBR tall boy - the cocktail is making a serious comeback these days. Walk into any bar, from the Back Bay to the North End to Dorchester, and you're bound to see people of every demographic drinking classic cocktails such as Manhattans, Sidecars, and even the occasional Rusty Nail.For Paul Clarke, creator of cocktailchronicles.com, this renaissance is long overdue. Clarke started his site nearly three years ago as a way to document his own love of cocktails and to help introduce the chocolatetini-addled masses to the pleasures of grown-up drinks. The site includes Clarke's writings on his drinking adventures in Seattle, but also has a terrific collection of cocktail recipes, drink reviews, and a scarily long inventory of his own liquor cabinet. My favorite drink I've never heard of before: Test Pilot. Lime juice, falernum, Cointreau, Angostura bitters, Pernod, light rum, dark Jamaican rum. I would guess that after one of those, the only thing you're qualified to pilot is the Parrot Troopers ride at Disney World. With the variety of cocktails out there these days, Clarke's drinking philosophy is simple: stick with what works. "I take a very old-school approach," he says. "If a drink has been enjoyed for decades, there's probably a good reason. We're living in a fantastic time, with vintage cocktail ingredients coming back on the market." 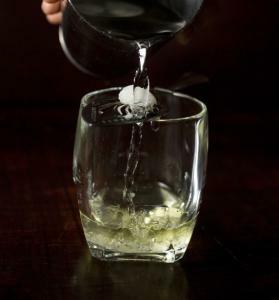 Clarke, whose own go-to drink is the Manhattan, points out that the reemergence of absinthe on the drinking scene is a sure sign that the worm has turned. "That's probably the most misunderstood spirit out there, with people talking about it causing hallucinations. It's not meant to be done as a shot, folks."